I’m thrilled to be working with One Day Web and their brilliant innovative business. 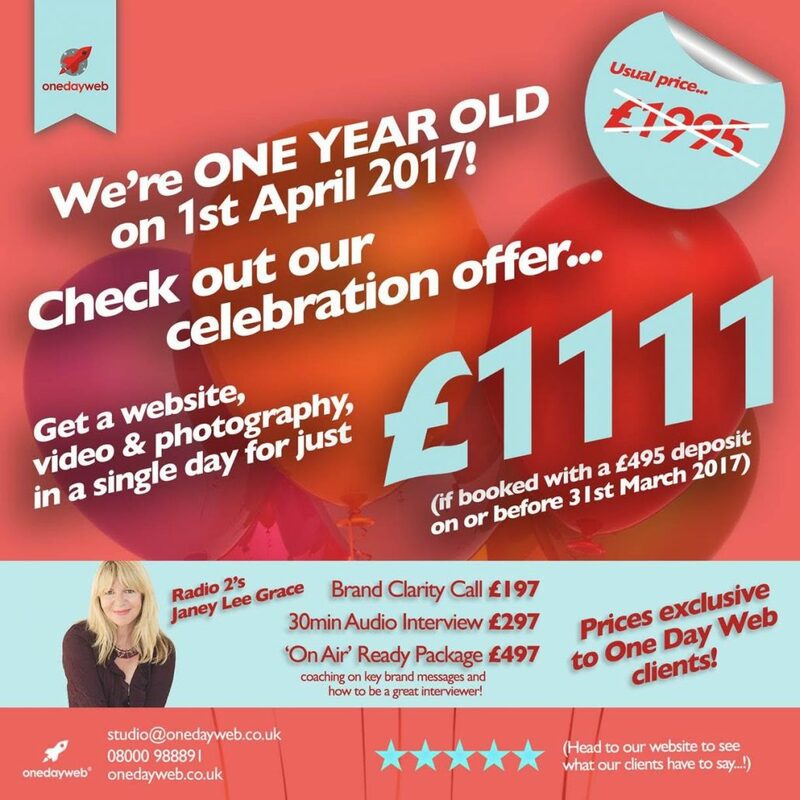 To celebrate their first-year anniversary they are offering a fabulous deal to get your website, a promotional video and photography sorted in just ONE DAY! As busy business owners, these are often the things that don’t get sorted, yet they are imperative for your professional image and to attract the clients you want. If you want to launch your business into the world, or update and upgrade what you already have, then this offer is for you! My Special Offer To You! to make sure the website you do create really presents you and your brand perfectly and attracts your ideal clients, normally £249 yours for just £197. I’m offering a 30 minute ‘Audio Interview’ which will showcase your key messages and your USP. It’s great marketing to have your own interview with a leading broadcaster and it’s just £297. Or choose my ‘On Air Ready’ package which is the ultimate in getting clarity on your USP and getting you PR ready with your own personal PR strategy for just £497, that’s £200 off the normal price. This is a super opportunity and great value so don’t miss out, offer ends March 31st 2017. Just contact us to let us know you are working with One Day Web and which special offer you’d like to go ahead with.